Trimec Flow Products rotary piston flowmeters are designed to provide years of unsurpassed performance in all types of applications and all types of environments. Whether on board of trucks or on ships, in loading terminals, mounted on mobile skids, on the farm or in the factory, Trimec-FP flowmeters are up to the job. 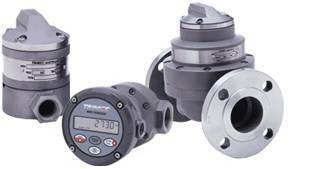 All meters are custom built and calibrated in our factory to suit specific applications. The advantages of the Trimec Flow Products rotary piston flowmeters are that they are particularly suitable for high viscosity products, offer good accuracy and repeatability, not affected by changes in viscosity, cost-effective and require little maintenance. Off-truck metering of refined fuels, LPG, aviation fuels, fertilizers. Loading terminals for over-the-road tankers and railcars. Boat and general marine refuelling. Agricultural chemicals batching and blending. Liquids routinely metered include: fuel oil, gasoline, kerosene, avgas, Jet A, LPG, ethanol, bio-diesel, diesel exhaust fluid (DEF), fertilizers, solvents, alcohols, petro-chemicals, liquid sugars, fruit juices, alcohols, acetic acid, caustic soda, grease, glucose, ink, insecticides, latex emulsions, liquid sugar, margarine, mayonnaise, molasses, resin, tallow, urethane, water, xylene & liquid yeast and more.